Elaine is nursing a few bruises tonight as a result of being caught by the running backstay during a pre race gybe. As well as injuring Elaine the back stay was caught on the wrong side of the boom in winds gusting to 20 knots so we had to look after Elaine and get the backstay back on all in the five minutes before the start. Both came good about the same time so we headed off to the start line thinking that the pin end was on the wrong side of the start boat. In the pre race rigging we had missed the change from the No 2 course so we steamed down the line towards the committee boat to try to read the course flag which was inconveniently only showing on the far side. In the starters hand was an individual recall flag which I correctly thought was for us as we were running down the course side of the line. 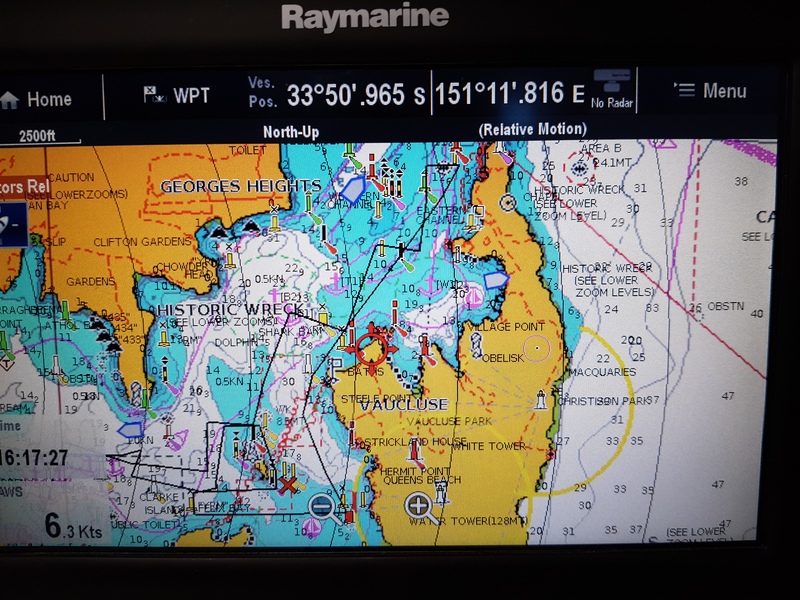 The gun went as the committee boat was abeam and we could read the No4 course flag so we tacked around the boat and went off chasing the fleet. Now the conditions were marginal for spinnakers at the best so we opted for caution and proceeded with the No 3 jib and a full main. 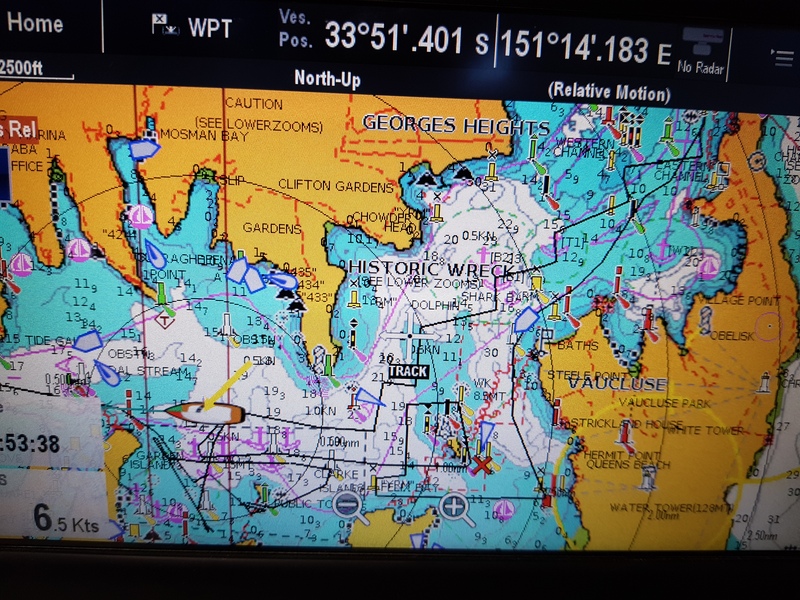 The first leg to Shark Island was a broad reach which is the strength for the Didi 40 cr design and in these conditions we were keeping up with the fleet. The brave ones flying spinnakers had their share of problems and a Far East 28 was spectacularly laying over in full broach mode. Even Avalon with what looked like a code 0 was not pulling away in this leg. 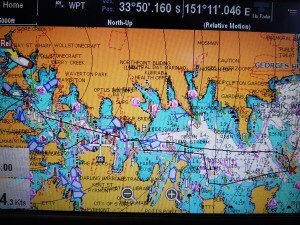 The very tight reach back to round Clark Island was also a good leg for Passion X. 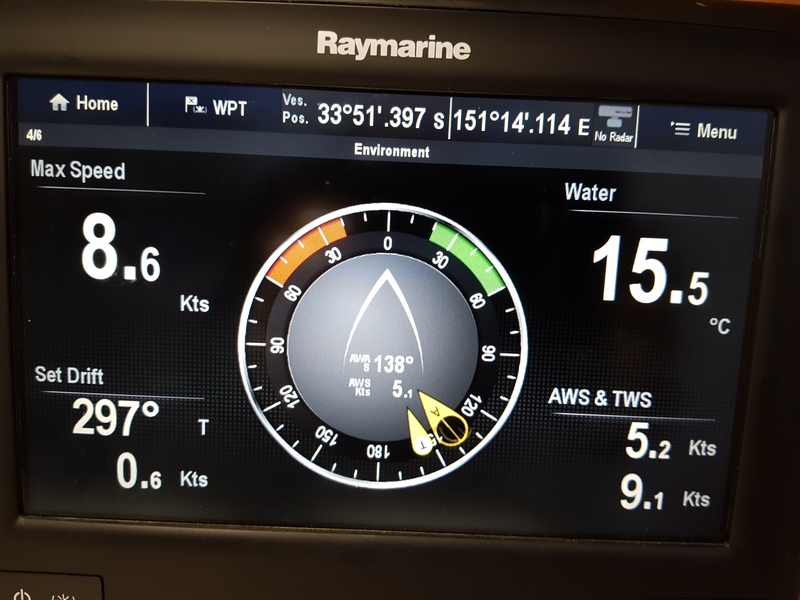 The leg was about 15 degrees off a hard beat and both the SOG and GPS speeds were reading over 8 knots which is the predicted speed under ORCi for 20 knots of breeze at this angle. 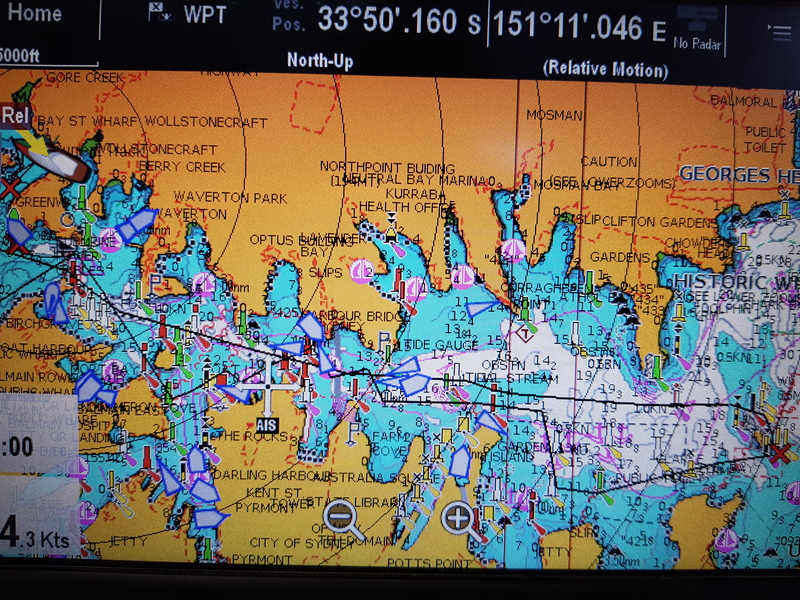 Once on the long slog to round Goat Island the more powerful Sydney 38, Avalon, pulled away. They have more form stability, a deeper keel and more crew on the rail and we have come to expect they will pull away in a breeze. 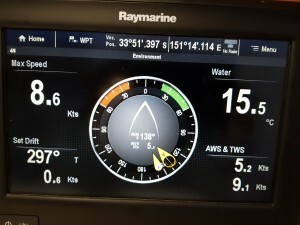 Occasionally i saw 6 knots on the speed gauges and we pulled away from the rest of the fleet except for the second Sydney 38 in the fleet, Utopia. We could see Utopia making up good ground and were happy to finish ahead. 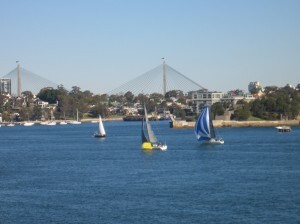 The third on handicap was a very good result for the crew of five. We enjoyed our day and Elaine is still smiling. 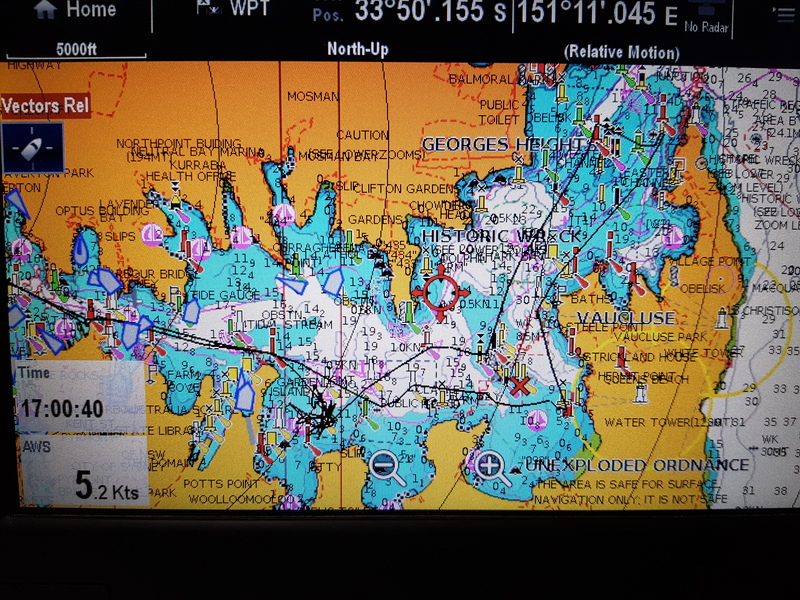 The track to windward were pretty good as the more open waters of the outer harbour gives more opportunity to work the shifts. Today was perfect for a bit of routine maintenance on Passion X as the sun was out but there was barely a breath of wind. I realigned the motor and prop shaft for the first time since launching last March. It was more of a check than any concern but it did require a little adjustment which took all the motor mount back to very nearly the centre of the range. After the realignment I took Passion X for a run to Balmain to see the Friday sailors drifting on a mirror like sea waiting for breeze for a start. Unfortunately breeze never came. 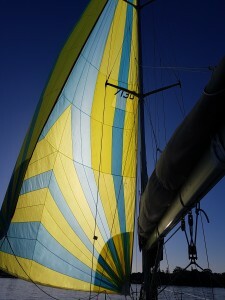 I made use of the calm conditions to hoist the asymmetric spinnaker and have a look at the settings. 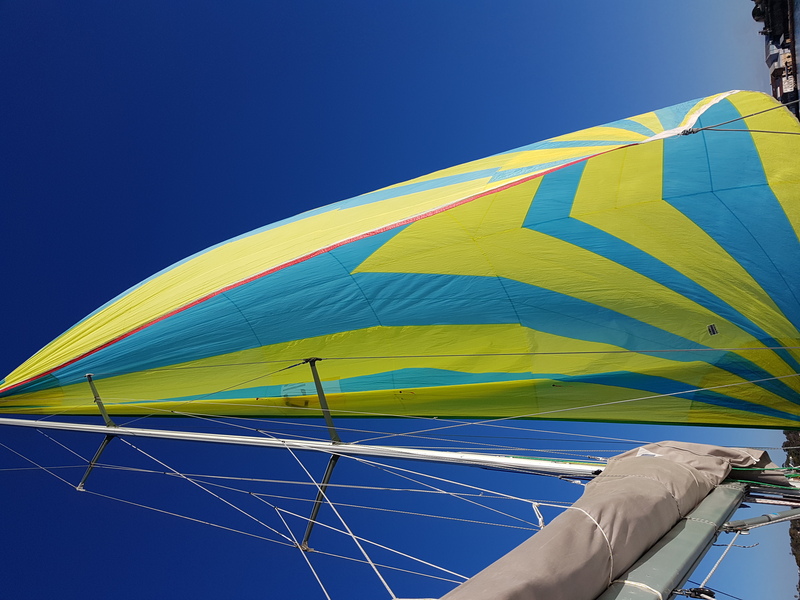 The spinnaker was on the wrong side of the snuffer haul up line but in the dead calm it was easy to unclip the tack and clew and put them on the correct side. Just enough breeze came through for a couple of photos, a gybe and more photos but not much else. Very nice sequence taken by a crew during the last West Harbour Winter Series. What a nice day for a drift! 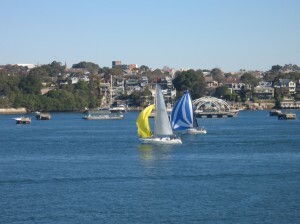 The sun was out and with no breeze the conditions on the water mid winter were very comfortable. 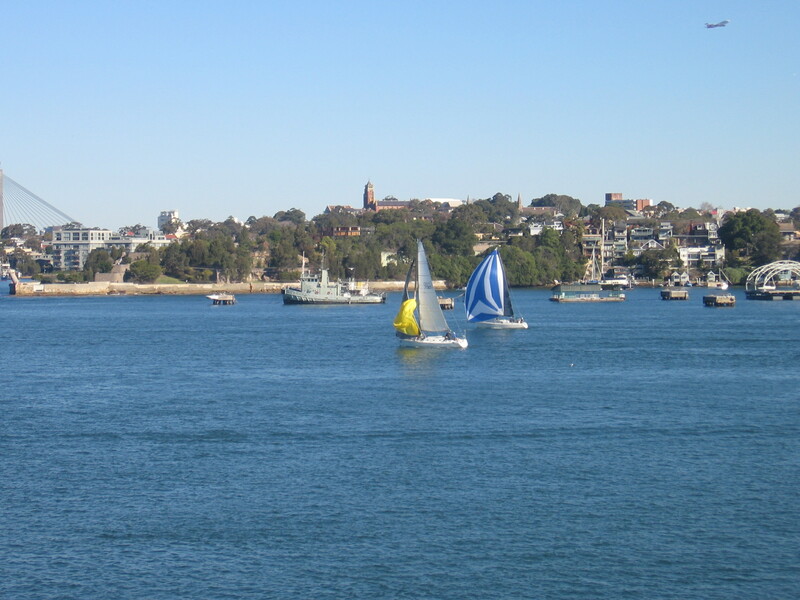 Gone was the cold of the previous two days when the east coast of Australia recorded some very low temperatures and in its place was soft winter sunshine. We started in very little breeze with the 1s fleet which started five minutes early still just in front of the starting line. 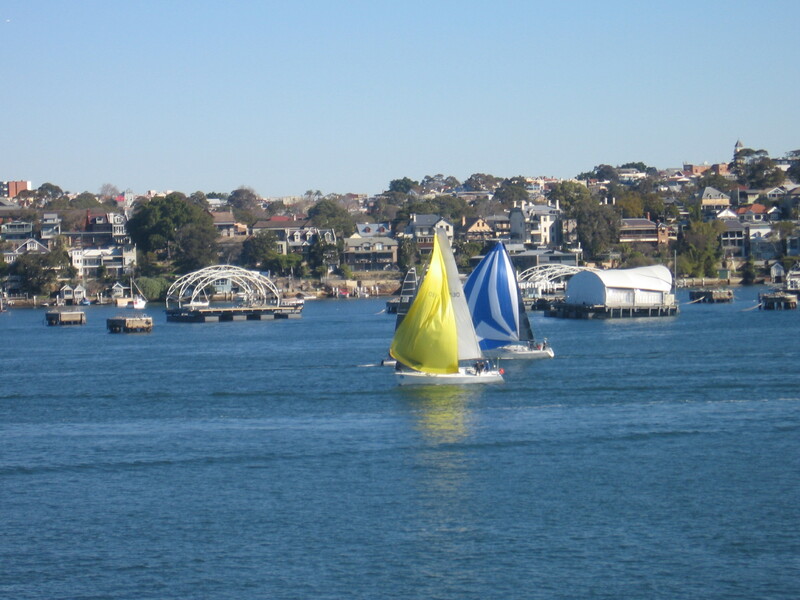 The division 2 boats also started while we were just in front of the line so it appeared like one big slow moving fleet drifting seaward on an outgoing tide. Much debate was had about the best end of the line on which to attempt a start and our final position right on the line in the middle was a reasonable choice. After a while of drifting we lowered the main halyard enough so that the boom sat on the rigid vang allowing the leech of the sail to droop to leeward. Next we sat all of the crew to leeward and then we just relaxed as we inched closer to the lead. 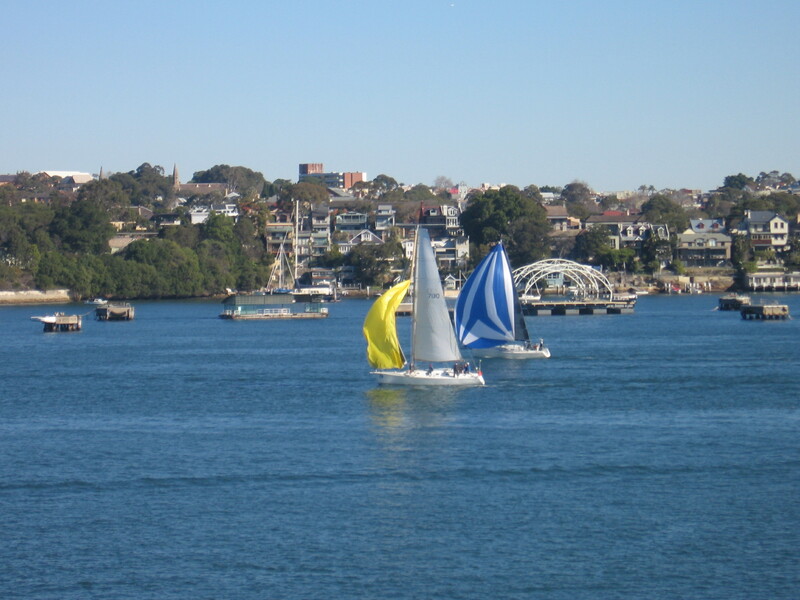 Soon it was Arunga, Amanti, Hitchhike, Passion X and Larrikin battling it out at the front of the fleet with Larrikin clearly ahead on handicap. By this stage this little group had passed the division 1s yachts, Duende and Blue Chip and were fast overtaking The Red Hand. In these conditions the less slippery the hull the better the tide gripped it and carried it to the front of the fleet. The though of poling our the genoa was tempered by the amount of resistance it might make to our progress with the tide. Mercifully, just like this post, the race was abandoned. 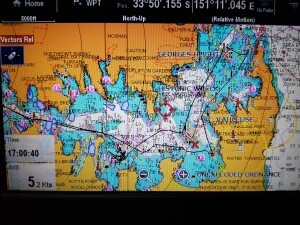 Light winds and tide make for record zig zag tacking angles. In this case the very light winds and the outgoing tide provided the perfect opportunity to record our worst tacking angles ever. 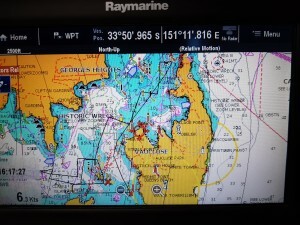 Now I have seen experts go worse and the Volvo Ocean race Tracker provided many examples of much worse conditions and we have heard of times when the fleet anchored not to the carried backwards. But for us this was as bad as it gets. 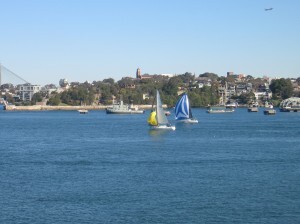 The short distance between Cockatoo Island and the Hunters Hill shore does not give a lot of opportunity to hang on in the lifts and tack in the knocks. It seemed to us that every time we approached a shore we were forced to tack away from a good lift. As the day wore on the breeze shifted to the north so the last work up the river along the Hunters Hill shore was more forgiving and we could hug the rocks in low flow areas and make some respectable progress. By then the game was over. 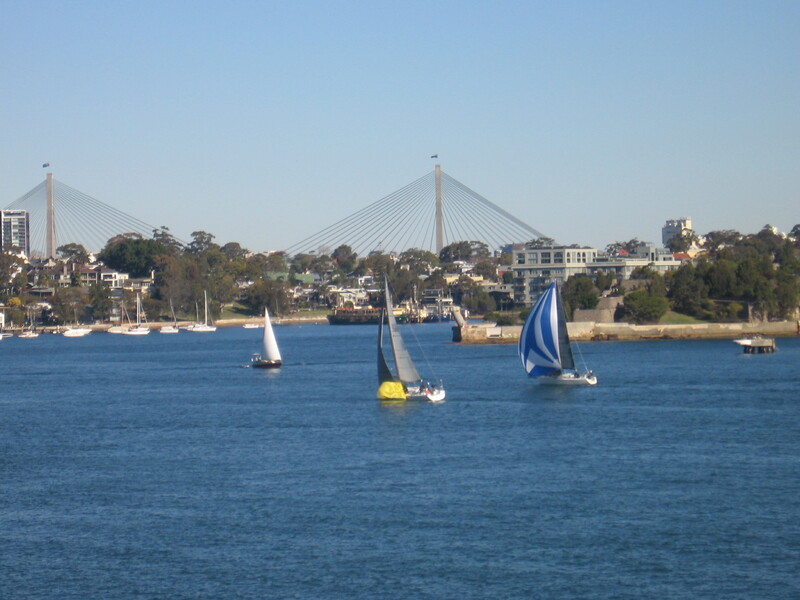 As every minute wore on the breeze softened the distance to the lead yachts who were closer to the finish went from minutes to fractions of an hour. Only those behind us fared worse with handicap honors generally going to the earlier finishers. We did have one bit of luck on the second work up the river when we tacked as the breeze came across the course only to have it stop advancing. 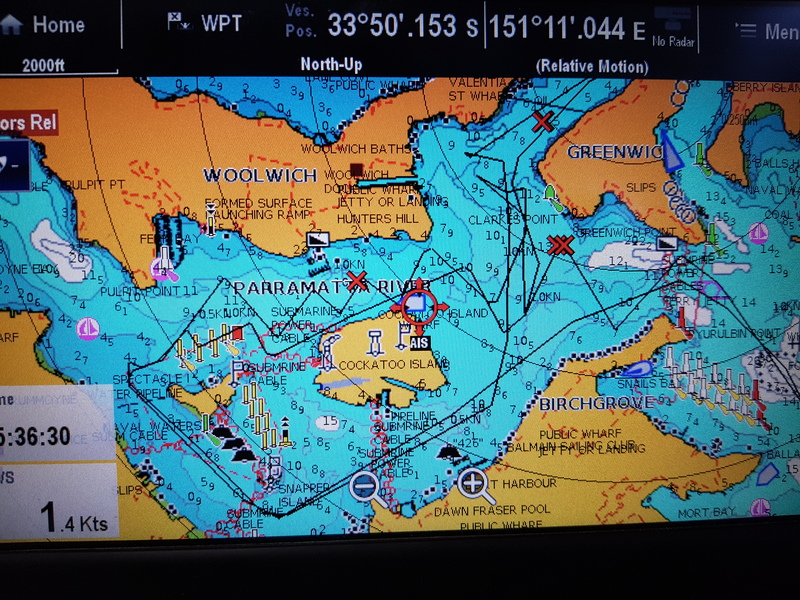 Now the crew were a bit dejected at the course we were taking away from the breeze but as happened for Another Planet on the previous leg and for Utopia on the tack before the southern side gave a brief respite and we came back with a handy lead over Utopia and Sweet Chariot. Another Planet was by this time in another world due again to the dying breeze. Good points for the day were beating Utopia across the line by virtue of that lucky tack on the last work and beating Another Planet courtesy of the dying breeze. Bad points were being thrashed by Irukandji who has done no wrong this series. It was in all a very pleasant day and topped off by a chat on the deck of knowledge after the race and negotiations on transfer fees for valued crew members. As a bonus photo painting of the carbon fibre whisker pole is progressing well under the awning. 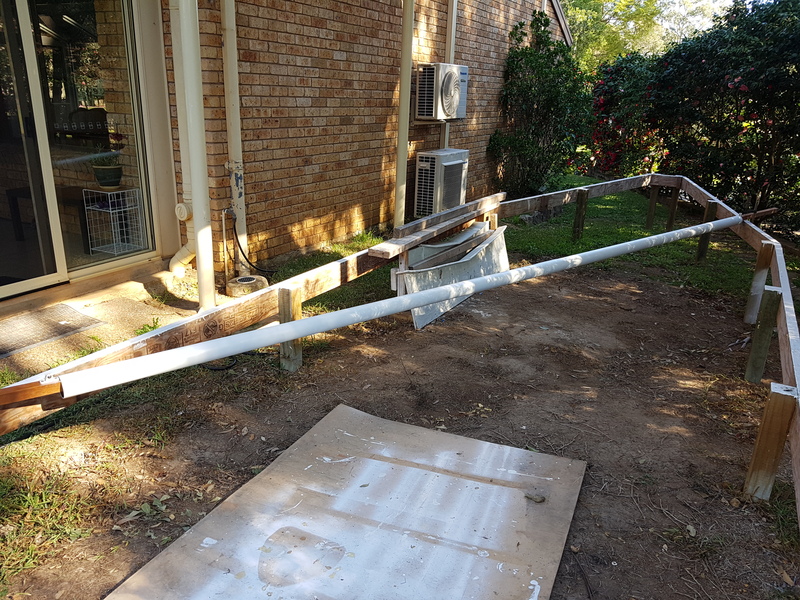 The pole is supported on posts at the two ends so it can be rotated easily for painting. Carbon fibre whisker pole mounted for easy rotation while painting. 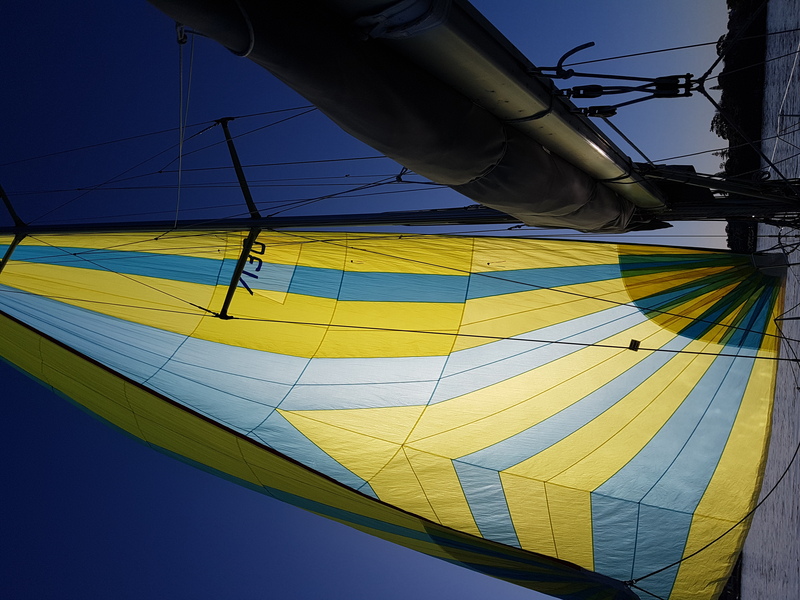 One of the advantages of overlapping genoas is that if you are doing “non spinnaker” racing you can pole out the overlapping genoa and have more projected sail area downwind. On Passion we had genoas with LP of greater than 6 metres and had both a 5 metre fixed pole and a 6 metre extendable pole. The large overlap genoa with the 6 metre pole was quite successful in the Greenwich Flying Squadron blue fleet. 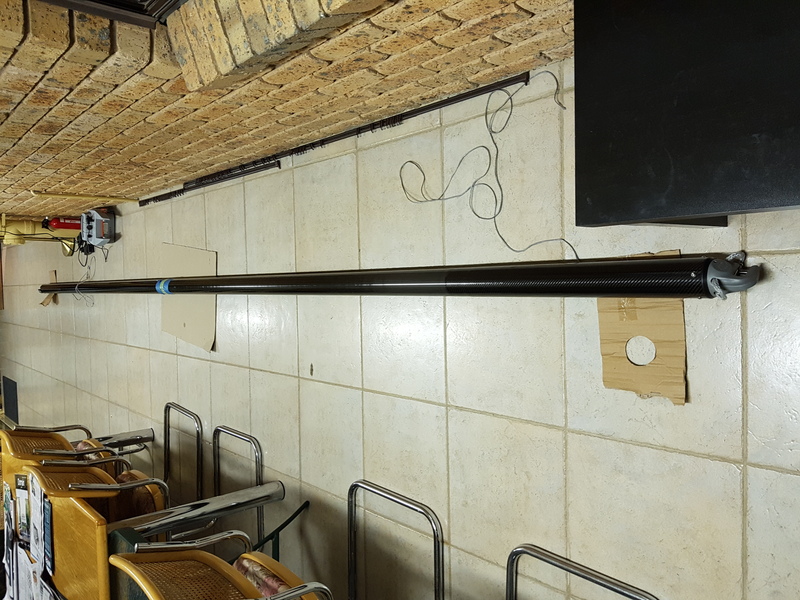 With Passion X, I was concerned to get a better ORCi rating and had the 5 metre pole cut down to 4,7 metres to match the 600 mm short bowsprit. The reduced length was not a big issue in strong winds but in the light winds the genoa transferred from Passion to Passion X was not setting well. 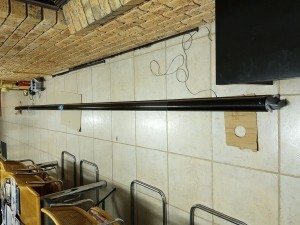 Also the extendable pole is heavy and difficult to extend in heavy airs. The crunch came when I dropped the 4.7 metre pole on Geoff’s head and I realized it was too heavy for safety. I subcontracted the task of finding a carbon pole to the crew and they came up with a suggestion of a CST pole from New Zealand. After a bit of negotiation we settled on a size and specification and Elaine agreed it was a good idea so we went ahead. As days progressed we found lots of bits missing from the quote and so the cost grew. 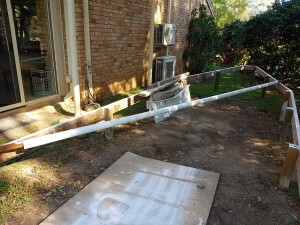 Because more work was coming in we let the cost grow including the GST when the kit arrived in Australia. I had proposed to put the kit together at Joe Walsh rigging and then motor over and throw it on board Passion X but the work was still piling up so I picked up the kit from Margaret Street in Woolwich and started the work at home. Tonight it is all joined up except for some extra carbon I am going to put over the outside of the join. A little bit extra carbon on the outside will improve the strength considerably due to both the extra thickness and the larger diameter. 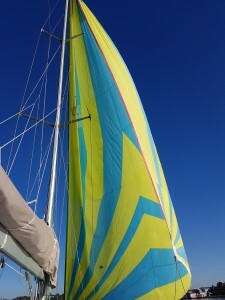 Still it will be a light air pole and mainly for poling our the genoa but we will probably give it a go on the big yellow spinnaker in the light airs where an extra 1.3 metres projection will be useful.